Create a course with multiple students. Create an assignment with 'File submissions' and 'Feedback files' enabled and set 'Maximum number of uploaded files' to '5'. Add a submission with multiple files (some being text) with different names (include weird characters in file names) and folders (with files inside). Repeat the above 2 steps with multiple students creating different file structures each time. Log in as a teacher/admin. Visit the assignment and click on 'View/grade all submissions'. Under 'Grading action' select 'Download all submissions'. Confirm that the zip contains the folder structure you created during submissions and the files have not been renamed. 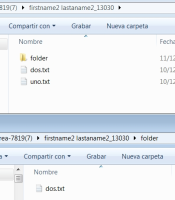 Using the downloaded zip obtained from the above test change the text file content and add new files. Under 'Grading action' select 'Upload multiple feedback files in a zip'. Confirm the feedback left for the students is correct. Revert the commits for this issue, or checkout another branch w/o these commits (so you are downloading the old file structure). Reintroduce the commits for this issue. Edit the files in the zip you downloaded in step 1. Test 1 Create a course with multiple students. Create an assignment with 'File submissions' and 'Feedback files' enabled and set 'Maximum number of uploaded files' to '5'. Log in as a student. Add a submission with multiple files (some being text) with different names (include weird characters in file names) and folders (with files inside). Repeat the above 2 steps with multiple students creating different file structures each time. Log in as a teacher/admin. Visit the assignment and click on 'View/grade all submissions'. Under 'Grading action' select 'Download all submissions'. Confirm that the zip contains the folder structure you created during submissions and the files have not been renamed. Test 2 Using the downloaded zip obtained from the above test change the text file content and add new files. Log in as a teacher/admin. Visit the assignment and click on 'View/grade all submissions'. Under 'Grading action' select 'Upload multiple feedback files in a zip'. Upload the new zip. Confirm the feedback left for the students is correct. Test 3 Revert the commits for this issue, or checkout another branch w/o these commits (so you are downloading the old file structure). Visit the assignment and click on 'View/grade all submissions'. Under 'Grading action' select 'Download all submissions'. Reintroduce the commits for this issue. Edit the files in the zip you downloaded in step 1. Upload the new zip. Confirm the feedback left for the students is correct. 3- As the teacher, "Download all submissions as a zip" in "View/grade all submissions" section. You should only see both files in the folder. Currently the mod/assign provides a link to "Download all submissions as a zip", which is great except that all the students' work shows up in the same directory. Instead of using a modified filename to separate students' work it would be better to put each student's work into a separate folder (named with the student's first & last name), and then keep the original file name (and extension) for each file. Folder name for each student (for all submission types): "firstname lastname_uniqueiduser"
MDL-29343 Separate folder for each student's work in "Download all assignments as a zip"